They leave grooves in the soil making hard walking, and cover up young plants really bad, and leave weeds behind!---other than that they great! LOL!---thats why I prefer the troy-built for cultivating with!---problem with them is that they are slow! SONNY wrote: They leave grooves in the soil making hard walking, and cover up young plants really bad, and leave weeds behind!---other than that they great! LOL!---thats why I prefer the troy-built for cultivating with!---problem with them is that they are slow! Here is the back of mine on the 72.---I used the 3-point lower holes to pull the bars from and removed the 2 small 3 hole tabs, the round ends slide right into the holes.---chains will lift them,--since I didnt get any rods/springs with mine to put down pressure on the units.. The brackets/bearings are going for aBOUT $50 FOR THE RIGHT ONE AND $60 FOR THE LEFT. For some reason the left ones get broken. Ok, now...... New problem..... I put the plow on today, and I cant get the pitch of the plow correct to start biting into the ground.......Any suggetions? "What people need today, are cleaner minds, and dirtier fingernails." allis man wrote: Ok, now...... New problem..... I put the plow on today, and I cant get the pitch of the plow correct to start biting into the ground.......Any suggetions? Do you have the depth control installed? The depth control hooks to the drawbar right? If so, yes. I still cant get it to bite into the ground. Using Cub - 144 cultivators to dig potatoes? 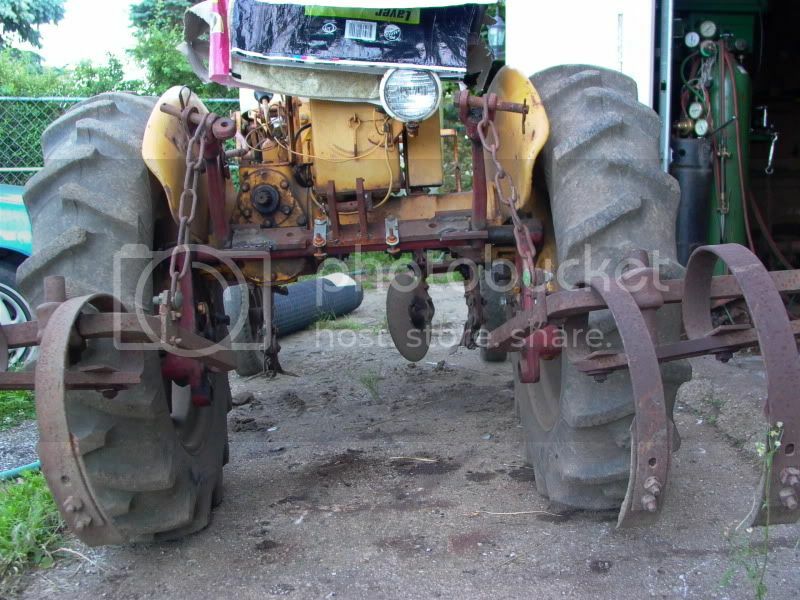 Regular cub cultivators on a cub lowboy?